There is no substitute for measuring ingredients accurately. It's all over the Food Network on TV. Exact measurements give you consistent results. Purchase one of these adjustable measuring spoons and you will never have to worry. 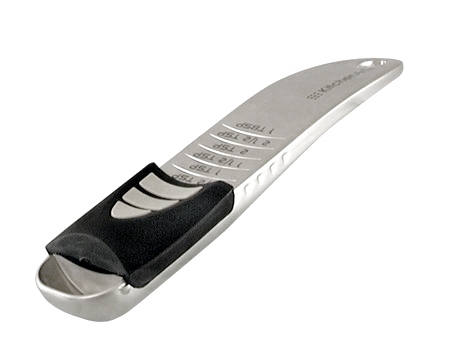 This 1 Tablespoon Chef Pro Adjustable Slide Measuring spoon (Letter B) in the beautiful Satin Finish has a unique slider that easily locks into place at 1/2 tsp., 1 tsp., 1 1/2 tsp., 2tsp., 2 1/2 tsp., and 1 tbsp. increments. Slider is removable for cleaning! Great for liquid or dry ingredients! Constructed of durable metal and polymer this product is strong and dishwasher safe!